The blade of this ikul has a beautiful curved sculptural form. It has been polished towards the edge and dulled black in the middle. The blackened section has two pierced holes that are now filled with copper. Between these are three rows of small hammer marks. These are hammered from the reverse sides of the blade to imitate a negative mirror image on each side of the blade. The wooden hilt is wrapped with copper strips. The pommel is octagonal and sheathed with a thin layer of sheet copper. Small nails secure the metal strips and the copper sheet to the hilt. 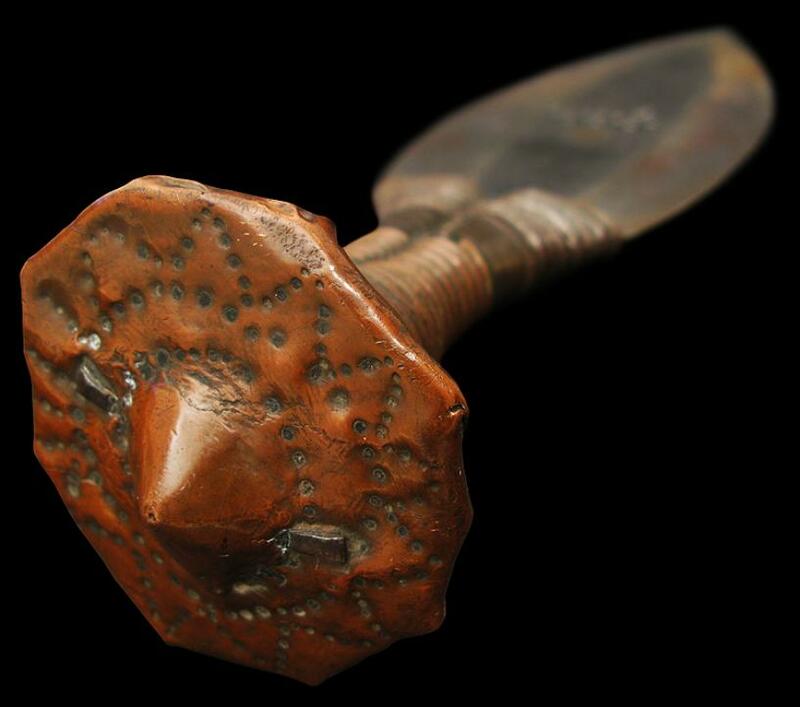 The copper on the base of the pommel is decorated by a circle of hammered triangles around a protruding centre. ikul is symmetrical in shape. The blade is of locally forged iron and is in fine condition with little oxidation. ikul. The ikul was symbolic of their masculinity, class, warriorhood and kingship. The Kuba people were well known for their blacksmithing skills, which were considered a royal art with royal patronage. Knives, axes and currency blades were made from forged iron, the forms of which often exhibit inventiveness and workmanship beyond what was functionally necessary. Ikul can be seen in the Ndop, the carved wooden portraits that commemorate each Kuba king. 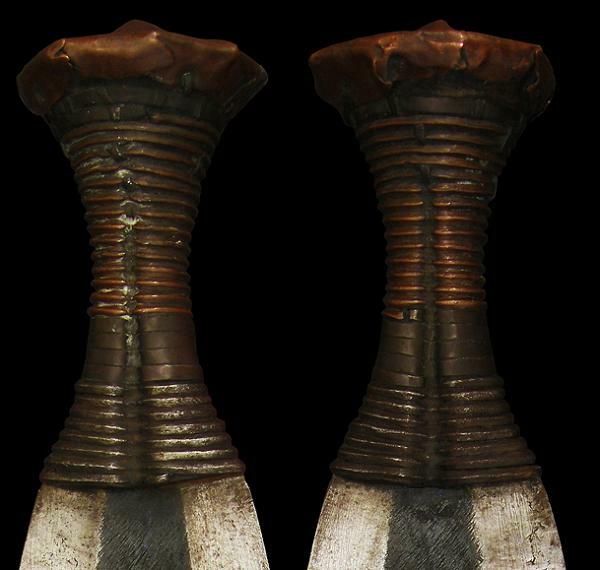 Ikul knives that bear a conical pommel appeared in the early seventeenth century under the patronage of King Shyaam aMbul aNgoong (his Ndop currently is displayed in the British Museum). They were carried exclusively by the ruling Bushoong clan as a symbol of peace. A weapon symbolising peace might seem counterintuitive, but the Kuba believed that peace could only be assured by possessing powerful weaponry, which could act as a deterrent. 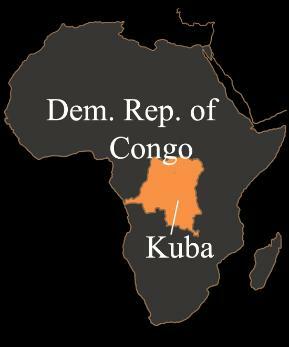 The Kuba Kingdom (1625-1900) was a pre-colonial central African state within Zaire (known as the Democratic Republic of the Congo today). It began as a loose conglomerate of several tribes with no central authority. Around 1625, Shyaam a-Mbul Ngoong-Shyaam united all the tribes under his leadership. According to folklore, Shyaam a-Mbul was the adopted son of a Kuba queen.